June 10 sparked plenty of excitement within Downtown Bay City as they awaited the opening of the new indoor farmer’s market, City Market. City Market prides itself in its home grown, handmade, locally owned foods and vendors who bring their best product to the table. The Market has booths for up to 47 vendors available in addition to a commercial demonstration kitchen plus community seating areas. Serenus Johnson worked alongside William A. Kibbe & Associates as the architectural & engineering design firm throughout this project. As a team, we converted the original JCPenney building into an urban space that serves a new multitude of clientele. Design work began in November 2016 and the project team began working under an aggressive schedule to complete the renovation by June 2017. This $3 million-dollar renovation included architectural design for vendor booth layouts, restroom expansion, interior design, new exterior windows, new building facade, roof structure. There was also electrical, mechanical, and plumbing design including renovations to the existing systems and introducing a new design for the LED lighting throughout the building, HVAC, electrical service and distribution. Several vendors required specific types of sinks, ceilings and lighting, which Serenus Johnson coordinated the installation of. The team also worked to provide electrical power at each vendor booth and installed a return gable on the roof to support the new City Market facadeSJC . 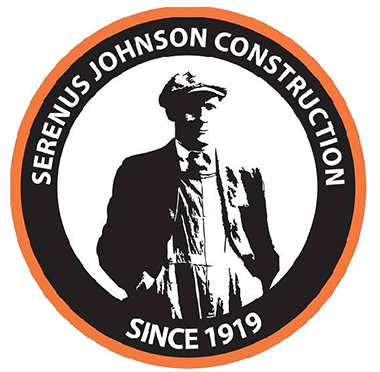 Serenus Johnson worked diligently to control other tenants’ exposure to dust and noise, which is commonly found on construction sites. The entire space of the market has concrete polished floors, each vendor booth has a steel grid and wall system built to support plumbing and mechanical work. The vendors have customized MEP work in each booth. Over 35,000 visitors came to experience the City Market it’s first week. The success that this new farmer’s market has brought on has been a positive change for the Bay City community.